Watercolour tutorials continue with the principle of not running before you can walk, nonfigurative exercises are the way to gradually familiarise yourself with materials and paper. So much of watercolour is to do with accidents and improvisation that it is really good to have some fun just "playing about" with colour. I do this all the time. 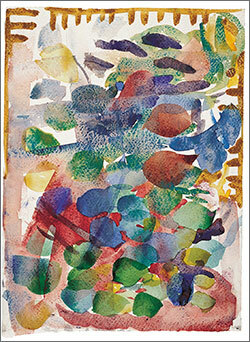 I have large collections of scraps of paper which I use to test colours; but I do far more than that. I experiment all the time with shapes and patterns and textures. One of the challenges of watercolour is that different papers and different colours behave differently and it is so enjoyable finding out. I have portfolios full of nonfigurative paintings done this way - unfortunately so far there doesn't seem to be much market for them. Having decided what you want to paint, got your materials and dedicated yourself to simplicity, you now have to put aside your inspiration and just take your brush, dip it in some colour and swirl it about on a piece of paper. Make lots of strokes, circles and spirals. See what happens when you dip your brush in a thin wash and take it for a walk (with squiggles and loops) over the paper, never lifting it off until the paint runs out. It will amaze you how far you can go. Now make some bold stripes in strong colours leaving lots of white space between. Now fill in the white spaces with other colours and watch what happens when one colour touches another. Magic, or mischief when you don't want it to happen (like the sky running into the hill in a landscape) but with nonfigurative art it doesn't matter. You should have at least two brushes, one round and one square-ended. Try making as large a variety of marks as you can. You can make dots and lines with the round brush and all sorts of things with the square. You can make short lines by using it upright. You can also use the sides. Use the flat side for almost-dry paint which you can drag across rough paper to get all sorts of shimmering effects like sunlight on water. 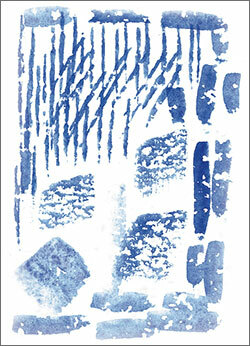 To do this you have to mix up a wash of thin paint, dip the brush in it and then dry most of it off with a tissue. If you drag it very fast you don't even need to dry off too much because it will naturally speckle as you drag the brush over the paper. There is a whole host of lovely things you can do with wet paper but if you get it too wet there comes a point when you can do nothing with it; it just won't take any more paint. 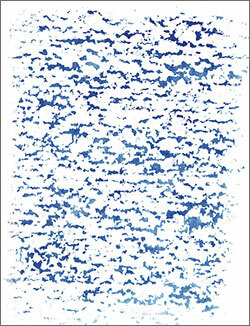 The best idea is to carefully paint some squares on your paper in either water or a thin wash of colour. 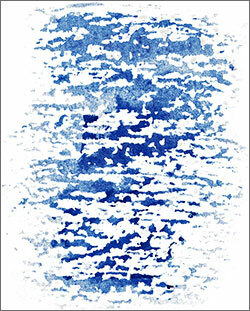 The best way to lay a wash on paper is to tilt the paper very slightly and put the wash on in an orderly manner by starting with a line at the top of the square and catching the drip with the next line until you reach the bottom when you dry out the brush and lift off the residual drip at the bottom. This makes a very smooth area. Now mix up some strong colours and make several long strokes in different colours across the wet and dry areas of the paper. You will find that there is a lovely contrast between what happens in the wet areas and the dry areas. 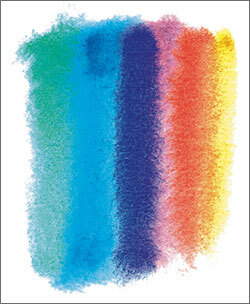 One of the most beautiful things about watercolour is the translucency of a light toned wash. If you lay one wash over another that has dried, you will see the under-colour clearly through the top one. 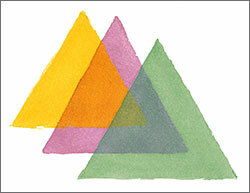 An exercise my students particularly enjoy among the watercolour tutorials is called "triangles". On a piece of paper draw lightly in pencil three fairly large isosceles triangles. Now paint them in three different colours using very thin washes. When they have dried, draw in three more triangles in such a way that they overlap with parts of the first three. Now paint them in the same way as the first three, with light toned washes. Repeat the procedure two or three times until your paper is covered with a myriad of triangles in shimmering soft colours. As they tend to look a little like sails, I sometimes round this off with a single circle painted in bright orange to represent the sun. These are suggestions of things you can do. You will find lots more of your own. Such exercises are never a waste of time - you are learning by experimenting, the way children do.